WASHINGTON (CNN) -- President Obama took aim Thursday at conservative critics who claim that he is using the economic crisis to ram through an unrelated, expansive domestic agenda. 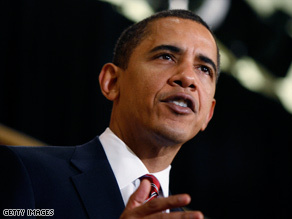 President Obama says recent problems in the markets are only part of a larger crisis. The president told a group of business leaders that although he is not interested in increasing government's role in America, a sustained economic recovery will be impossible if the country fails to address long-term structural problems in its education, energy and health-care systems. "I am not choosing to address these additional challenges just because I feel like it or because I'm a glutton for punishment," Obama said at a meeting of Business Roundtable members. "I am doing so because they are fundamental to our economic growth and ensuring that we don't have more crises like this in the future." The president argued that the recent problems in the financial market, though "acute and urgent," are only one part of a larger, systemic crisis. "We must build this recovery on a foundation that lasts -- on a 21st century infrastructure and a green economy with lower health-care costs that creates millions of new jobs and new industries; on schools that prepare our children to compete and thrive; on businesses that are free to invest in the next big idea or breakthrough discovery," he said. Obama said that any delay for new investments in education, energy and health care would only continue "the same irresponsibility that led us to this point" and ultimately weaken the recovery. Obama also directly addressed concerns over his tax plan, arguing that nobody's taxes will be raised before the end of 2010. At that point, he claimed, the top rates will still be lower than they were during "the prosperity of the 1990s." Alluding to the political stakes, the president said that the country would be on an economic upswing by 2012, "or else you'll be listening to someone else in 2013." Obama' current term ends in January 2013.